Psychometric assessments have become an essential tool for evaluating job candidates before they are hired. 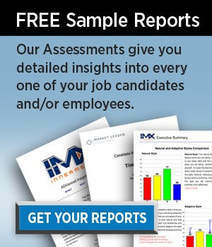 Using a battery of tests, these assessments help hiring managers see below the surface during the evaluation process. Through our training, we will show your hiring managers how to conduct the assessments, how to read the results and, most importantly, how to interpret the results as they relate to jobs being filled. This program is intensive instruction, exercises, and testing on the assessments. Includes two full-day workshops at your location with ongoing assistance available.